Listen to the amazingly varied songs and haunting calls of our wetland birds, easily accessed at the touch of 12 simple sound buttons. Features a wealth of interesting facts as well as beautiful photographs and high-quality bird sounds. A great book for all the family to share and enjoy. 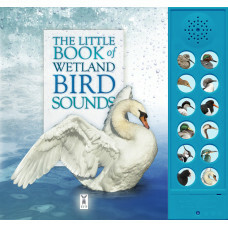 A much-anticipated sequel to the highly praised sound book series that includes the bestselling Little Book of Garden Bird Songs, Little Book of Woodland Bird Songs and Little Book of Night-time Animal Sounds. Includes curlew, teal, reed warbler, black-throated diver, avocet, oystercatcher, mallard, crane, lapwing, kingfisher, coot, mute swan. High quality sound module with replaceable batteries. Conforms to European Toy Safety Directive requirements.